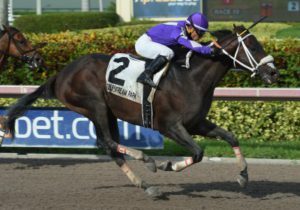 Ricardo R. Vallejo’s Deland, a multiple graded stakes winner in Puerto Rico, picked up his first stakes win since returning to the mainland, coming from off the pace to take command of Sunday’s $75,000 Coast is Clear Stakes at Gulfstream a furlong from home and drawing off to win by two lengths. Fellow OBS graduate Hy Riverside (April ’14) checked in third. It’s the fifth stakes victory for the 6-year-old Florida-bred son of Gottcha Gold, consigned by Hawks Nest LLC to the 2013 OBS August Yearling Sale where he was purchased by Greg Jackson, Agent for Ruben Vallejo, for $12,000. Trained by Victor Barboza, Jr., he’s now 21-11-6-2 and has earned $268,249.